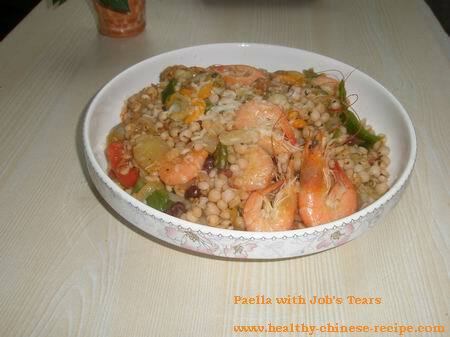 Filter,take Job's tears to cook paella. Leave the soup as drinks. 1. Clean all the seafood. Poach in boiling water, take out quickly. Shell and devein. 3. Heat oil in a wok. Add Seasoning A, stir fry. 4. Add tomato cubes and Seasoning B, stir fry. 5. Add in Job's Tears. Stir fry for 3mins. Add 1 tbsp seafood soup if dry. 6. Add in seafood, simmer for 10mins. 7. Turn off heat. Spread a layer of cheese. Serve. Job's tears benefit the lung, anit-cancer. The soup is the good drink to clear heat and remove dampness.